Each party in the case (Sandra Little Covington, et. Al., State of North Carolina, legislators) will submit briefs to the three-judge panel addressing issues in the case and how they think those issues should be handled. 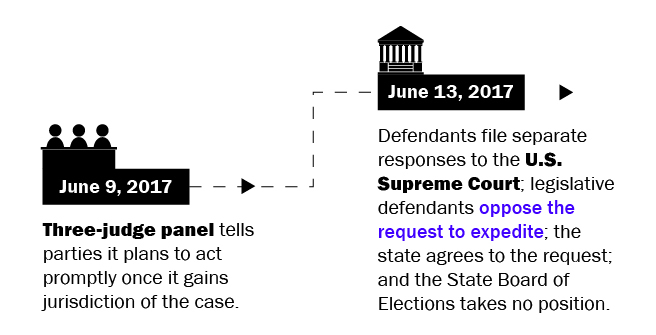 The three judge panel will decide a timeline for when new maps have to be drawn and whether or not there will be special elections as a remedy for the constitutional violations. 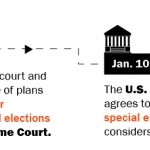 Any action in either of the above matters could result in a number of legal challenges back to the U.S. Supreme Court: i.e., if the court doesn’t like the new maps that legislators submit and draws its own maps, legislators could appeal those maps; if the court orders special elections, legislators could appeal that remedy as it did previously, etc. 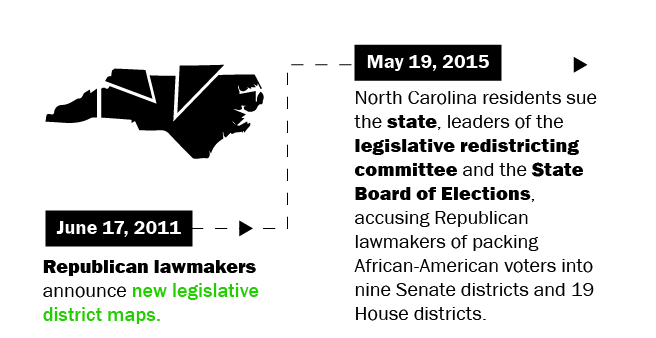 North Carolina statute requires a minimum of two weeks for legislators to draw new maps. 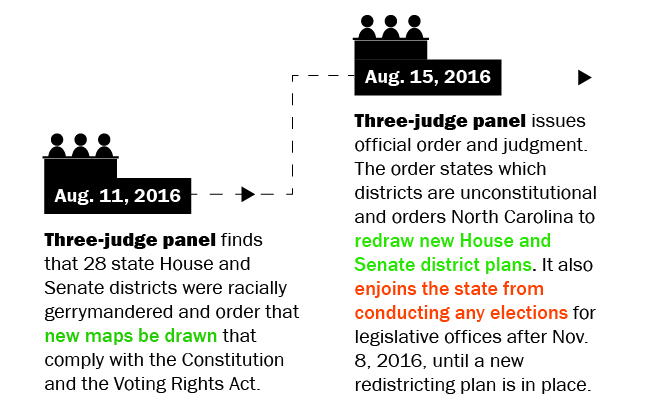 It’s been a little over a month since the U.S. Supreme Court ruled that 28 state North Carolina House and Senate districts were racially gerrymandered but lawmakers have yet to draw new maps. In the last month, there’s been some back-and-forth in the courts over North Carolina v. Covington, numerous headlines about the case and several rallies calling for immediate action from the legislature. 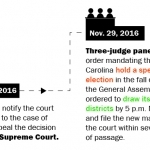 The case is currently pending in the U.S. District Court for the Middle District of North Carolina, where a three-judge panel will oversee the redrawing of the illegally gerrymandered maps and decide whether special elections before the regularly scheduled 2018 elections will be a proper remedy for the constitutional violations at hand. Lawmakers recently committed to holding a special redistricting session no later than November 15 to redraw the maps but the court will have the final say on a timeline for the process. Legislative leaders have stated multiple times that they will not redraw anything on their own (without the lower court’s direction). 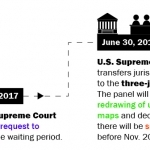 The plaintiffs initially asked the court to set a June 22 deadline for North Carolina lawmakers to redraw the gerrymandered districts, but the U.S. Supreme Court denied a request to expedite a transfer of jurisdiction so that timeline has expired. I thought the U.S. Supreme Court was the final judicial word – why is the case still pending at a lower court after the highest court’s opinion? 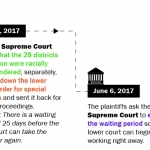 The U.S. Supreme Court affirmed the lower court’s finding that some of North Carolina’s legislative districts were racially gerrymandered but punted the case back to the three-judge panel for the implementation of a redistricting process. The high court also vacated the lower court’s initial ruling for the state to hold special elections this year as a remedy to the constitutional violations. However, justices also sent that part of Covington back to the three-judge panel for reconsideration, outlining factors that should be addressed before ordering such a remedy. So what did the Supreme Court actually do? 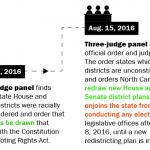 The high court made the final finding that 28 of North Carolina’s House and Senate districts were unconstitutionally racially gerrymandered. That means lawmakers can no longer defend those districts in court or use them for future elections. The court also offered some direction to the lower court about ordering special elections as a remedy in gerrymandering cases. Why hasn’t the lower court ordered lawmakers to redraw the maps yet? Once the Supreme Court issued its opinion, there was a mandatory 25-day waiting period before the three-judge panel could take over the case and issue any directives. Jurisdiction was officially transferred on June 30 to the lower court. 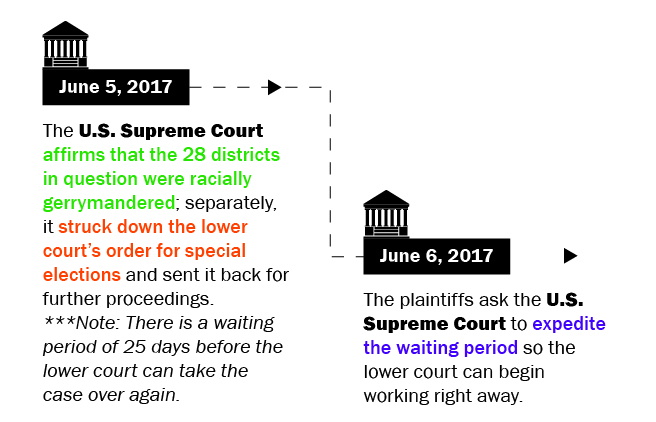 The waiting period is over, when will the lower court make a decision about the redistricting process? Good question. The three-judge panel has to hear from all parties involved in Covington before it can issue a decision. The panel has already asked the parties for briefs addressing the lingering issues in the case and said it would act promptly. The plaintiffs already filed their brief. Legislative defendants filed a notice with the court that they would file their brief within three business days of the jurisdictional transfer from the Supreme Court. They had until the end of the day yesterday, Thursday, July 6, to do so. Once all briefs are filed, the three-judge panel can either order a hearing or issue a decision in the case at their own speed. Who is redrawing the racially gerrymandered districts? Sen. Ralph Hise (R-Mitchell), who is currently under investigation by the state Board of Elections for campaign finance irregularities, and Rep. David Lewis (R-Harnett) were recently named chairs of their respective redistricting committees and tasked with redrawing the gerrymandered districts in Covington. Hise was a member of the original Senate redistricting committee when the racially gerrymandered maps were drawn in 2011. Lewis also previously chaired the House redistricting committee in 2011. You can see all the members appointed by legislative leaders to serve on the new redistricting committees here. Some of those named – in addition to Hise and Lewis – also served on the 2011 committees. Another great question to which there is not yet an answer. It’s not likely that there will be a special election this year, but the three-judge panel has indicated it will consider the option. The panel could, in theory, order a special election any time before the regularly-scheduled next election in November 2018. If legislators were elected unlawfully, does that mean their time in office is up? Not unless a court orders special elections. If legislators were elected unlawfully, is the legislation they passed while in office unlawful? No. Guy-Uriel Charles, founding director of the Duke Law Center on Law, Race and Politics, already answered this question. Charles said it would be reasonable for people to say “gee, these legislative districts are unconstitutional, therefore the legislators are unconstitutional and therefore anything that they’ve done is illegal and does not have any effect,” but that’s not the way election law typically works. “Election law says ‘OK, we’re not going to look backward … we’re not going to unscramble the scrambled egg because it’s hard to unscramble a scrambled egg; so we’re just going to start all over again and say, alright, going forward, we need to redraw these districts and the next question is often, do there need to be special elections?,” he said. Lawmakers can’t rely on race to redraw the gerrymandered districts – can they rely on voters’ politics? There’s nothing right now (other than best practices) that prohibits lawmakers from drawing districts based on voters’ political affiliations, but that could soon change. The comparatively new theory that partisan gerrymandering itself is unconstitutional is now the subject of litigation that is making its way through the courts. The U.S. Supreme Court recently agreed to hear such a case out of Wisconsin that has the potential to affect about one-third of the maps drawn for Congress and state legislatures across the country. 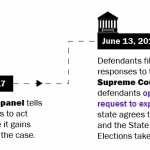 What is expected to come from the landmark case is a standard that will determine the extent to which lawmakers across the country can consider voters’ political affiliations when drawing district maps. 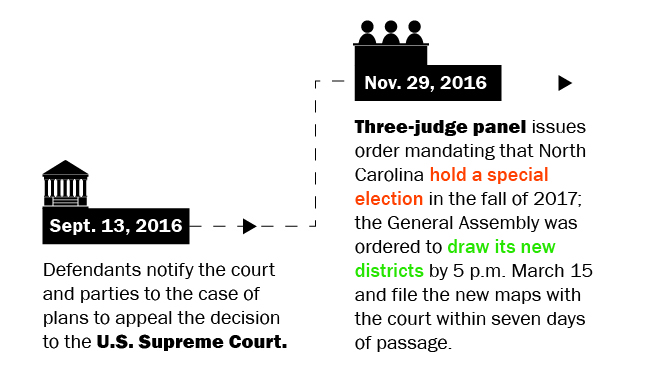 There are also currently pending challenges to partisan gerrymandering in North Carolina, including one at the highest court. Couldn’t the state save lots of taxpayer dollars if an independent redistricting process was enacted? Yes. Jane Pinsky of the N.C. Coalition for Lobbying & Government Reform has said that multiple lawsuits that have stemmed from redistricting have cost the state millions. You can hear her talk redistricting reform here. Is there any pending legislation that supports independent redistricting? Yes. A bipartisan group of lawmakers introduced House Bill 200 this session in an effort to end gerrymandering and take the politics out of redistricting, as much as possible. The bill, which has stalled after being referred to the Committee on Rules, Calendar and Operations of the House, was previously championed by Republicans. There’s no question that the next election will be held with new legislative maps. 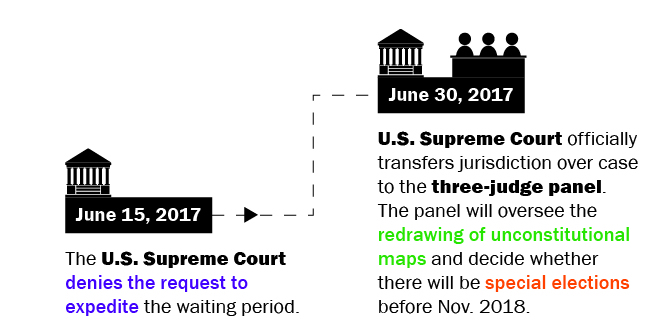 The next step, which will be guided by the three-judge panel, will be drawing those maps. After that, there could (and likely will) be more litigation. What does subdividing court districts have to do with voters? Everything.